A new tribute album dedicated to legendary guitarist Gary Moore will be released on October 26 via earMUSIC. Titled Moore Blues for Gary—A Tribute to Gary Moore, the album is the brainchild of Bob Daisley (Rainbow, Ozzy Osbourne), who had played bass with Moore since the early Eighties. It features guest contributions from Steve Lukather (Toto), Steve Morse (Dixie Dregs, Deep Purple), John Sykes (Thin Lizzy, Whitesnake), Doug Aldrich (Dio, Whitesnake, the Dead Daisies), Jeff Watson (Night Ranger), Glenn Hughes (Deep Purple, Black Country Communion), Eric Singer (Kiss) and more. Daisley continued: "When Gary passed away in 2011, the world lost one of the all-time greats. I don't think that enough was said or done at the time to acknowledge the loss of such a great player so I took it upon myself to pay personal tribute to the man and record some new versions of his music, mostly from his blues catalog. "I didn't set out to recreate anything that Gary had done, or to compete in any way. These arrangements and performances represent a 'hats off' to Gary and nothing more. 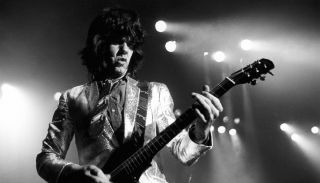 "Long live the memory of Robert William Gary Moore. Yes, he was another 'Bob' — something that I wasn't aware of for all of those years that I worked with him. "I feel such gratitude towards the people who contributed to this album and I'm honored to have worked with them all."